Oliver Queen is now mayor, and Team Arrow has been mostly disbanded due to Laurel's death. But there is still a lot of corruption and violence in Star City, and Oliver can't give up his bow just yet. Thea Queen is a queen. I haven't always liked Thea's character, but this episode showed her strengths. She's amazing. She organizes Oliver's position as mayor, and she can hold her own. When Oliver starts killing people, she stands up for what she thinks is right and she doesn't back down. There has been a lot of growth with her recently, and I'm loving it. Can I vote for her to be mayor of Star City? Thea Queen 2016, anybody? I've always loved Curtis, and my love for him has only grown with this episode. I'm so glad he's still around and now he wants to be part of the team. I'm excited to see what happens next! Since Laurel's death and the Damien Darhk disaster, Oliver has been rethinking his decisions as a hero/vigilante. He feels responsible for Laurel's death, so he's decided that he can't have a no-kill policy. Instead, he'll do what he must to stop the bad guys. Thus, the Green Arrow action has become even more epic than before. Plus, this is a great place for Oliver to be for character arc. I'm excited to see where it goes. At first, I thought I was going to be heartbroken by Detective Lance because we find him in a worse state than we've ever seen him before. But instead of spiraling further, the memorial to Laurel encourages him to become better. And now he's going to assist Oliver in saving their city. Huzzah! I feel like the fight sequences and the special effects this season are better than ever. It was a lot of fun to watch and experience. I don't know much about the ACU that Oliver is implementing in Star City, but it sounds exciting. I think the story line for this season will prove to have an interesting twist since Oliver is going to be working with the authorities of the city to get stuff done. We finally, finally see part of the hospital scene between Laurel and Oliver before she dies. Laurel makes Oliver promise that she will not be the last Canary. My heart was breaking during this because Oliver does make that promise, but he still blames himself and he's so hesitant to get anyone else involved with the vigilante life. I thought Laurel's promise was perfect. 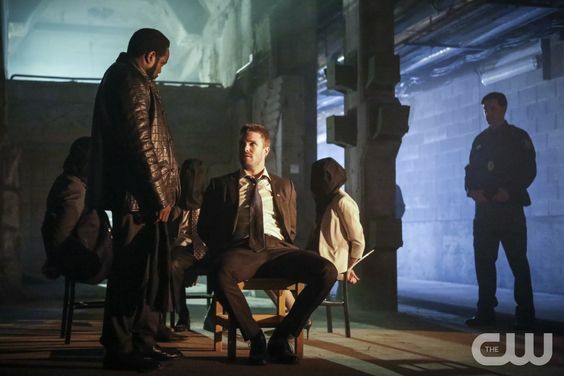 The end of the episode was the most thrilling because it hinted at a new Team Arrow. While I'm sad that the original Team Arrow won't be coming back together--at least not for the time being--I'm stoked to see new faces and heroes rise up from Star City to save the day. I think this will be a good move for Oliver, moving him into a mentor role. The new bad guy for the time being is named Tobias Church, and I wasn't very impressed with him. He was definitely angry and super violent. And now he has all the bad boy organizations under his thumb. I don't like him, which I guess is a good thing. Just when I thought there could be hope for Oliver and Felicity's relationship to rekindle, they throw another guy into the mix. A guy Felicity is living with and kissing. Who is he? I don't know, but I don't like him. He needs to get out. Now. That's it. This episode was pretty great. For the most part, this episode was fantastic. I enjoyed the action sequences and the new development with the characters. After season four left me a little disappointed in the show, this season is already shaping up to be exciting. I can't wait to see what happens next! What did you think of "Legacy"? What are you hoping to see this season?